One glance at the Olympus Stylus 1 and it's hard to ignore how much it looks like a smaller version of the interchangeable lens Olympus OM-D series. Only it's not: this is a high-end compact camera with design cues adopted from the company's top-end interchangeable range. If you've been looking for an advanced compact camera complete with electronic viewfinder and a greater zoom lens than most competitor models offer then the Stylus 1 certainly ticks all the boxes. It's a "do it all" compact judging by its specs. But it's also rather chunky and demands a serious wedge of cash to own one. Is its performance and resulting image quality worth every penny of that investment or does it not all add up? In terms of features it's hard to fault the Stylus 1. The 10.7x optical zoom lens delivers a 28-300mm equivalent with - and here's the most exciting part - a constant f/2.8 maximum aperture. "Let there be light" is the Olympus mantra - one that most standard compacts can't even begin to compete against. Just like the earlier XZ2 model the Stylus 1 is paired with a 12-megapixel 1/1.7in sensor which keeps the overall size down compared to if it was designed around a larger sensor. But a 300mm equivalent at f/2.8? That's never going to be properly small. And that's where the Stylus 1 will lose appeal for many, because it's not really a true pocketable camera. We also would have preferred the Stylus 1 to adopt a wider-angle lens, somewhere around the 24mm mark, but just like the XZ2 there's no such luck one again here. At 28mm it is just about wide enough to fit in a broad scene though. Even so, the lens does a fine job of pushing through its range at pace and there's even a lens control ring that can be assigned zoom, manual focus or - and as is most likely - settings controls, such as aperture or shutter speed adjustment. But the best feature of this lens ring is its dual function control. To the side of it is a switch to toggle between smooth rotation and stop-clicks. This makes for ideal manual focus control, aided by on-screen magnification to help with those fine detail moments (but no focus peaking, annoyingly), or click-by-click aperture control. Lovely stuff. It's positioned well for ease of use too. Olympus has its own way when it comes to camera operation. It doesn't conform to the norm when it comes to menu arrangements, controls and finding certain settings, which can take a little bit of getting used to. But it's no problem in the long term. There are plenty of customisation options available, however, so the fact the top thumbdial adjusts exposure compensation by default can be changed to a different setting, such as aperture control, if you so desire. And we did, because we always knocked that dial and shot with unwanted exposure compensation adjustments a few too many times. Arranged throughout the body are controls for everything an experienced photographer will want to get their hands on. There's a tilt-angle LCD screen, physical mode dial, two distinct function buttons, and a quick-access menu via the "ok" button to the centre of the rear d-pad. It's all well built too, with metal buttons and dials heading up the premium design. We alluded to the Stylus 1 looking like an Olympus OM-D camera - and that's something we can echo when it comes to autofocus performance. This is one fast compact camera that will snap subjects into focus in the blink of an eye. It's really top notch on this front. Focus is divided into single AF, Super Macro, continuous AF, tracking AF and manual focus from within the menu. There are 35 focus areas to select as the primary focus point by using the left directional button, but as the camera has a touchscreen it's also possible to simply touch the screen itself to target a subject. If that's not your style and you keep shooting random pictures by accidentally hitting the screen with a stray finger then this is easily switched off. But what is most "OM-D" about the Stylus 1 is the inclusion of an electronic viewfinder. If you've experienced other compact cameras with built-in finders then you're probably thinking it's going to be just as naff. But Olympus has really pushed the boat out here and delivered a 1.44m-dot resolution version which is the same size and resolution as found in the original OM-D E-M5. As far as compacts go this sort of viewfinder really is as good as it gets. A big view that's nice and bright makes composition in sunny conditions so much easier. We used it in Mallorca where the spring sun made it taxing to shoot with the screen, but with the viewfinder we had no such problems. It really did make all the difference. Adding a viewfinder does, inevitably, increase the Stylus 1's asking price. It's £549. Yep, five hundred and forty nine pounds. Which might sound like a lot, but considering everything on offer it's not as absurd as it may sound. 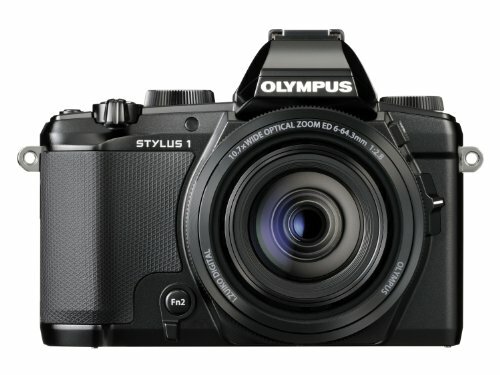 Think about it: the Stylus 1 is like an Olympus XZ2 with a long zoom and built-in electronic viewfinder. Yet the Stylus 1 is cheaper than an XZ2 with viewfinder accessory. There are also other competitors with high-end compact cameras, but none go down the long zoom route. There are great cameras such as the Panasonic Lumix FZ200, which also offers a constant f/2.8 aperture throughout its 24-600mm equivalent, but it's far larger than this Olympus; a whole different idea really. Elsewhere in the market there are larger sensor models that demand far more significant price tags. Think Canon G1 X Mark II and you'll need to fork out £799 for the pleasure - and that's without the viewfinder accessory. Again, different sensor size and different prospect, but it goes to show how this Olympus sits in its own position that makes it distinct. The real thing that would seal the deal with the Stylus 1 is image quality. But here's where we've been pleased rather than blown away. The camera has the same 12-megapixel sensor as the XZ2, but with that longer lens at play the light is being handled differently. We found some shots showed stacks of detail, whereas one example of a lake vista didn't scream out with the kind of sharpness and detail that we had hoped for, particularly towards the edges. Part of this seems to come down to the JPEG processing. When looking at raw files next to their JPEG equivalents the raw shots are inevitably less sharp but even at the lowest sensitivities have a lot more detailed grain in them. The in-camera processing seems to lose much of that for the JPEG shots, which can be a touch smeary as a result. A lighter touch could have assisted further. We're not implying that shots are bad by any means, there's just that association of spending over £500 on something that it should be best of the best. And there are similar priced cameras that will outshine the Stylus 1. Its saving grace is its feature set. Because having that f/2.8 lens available makes a huge amount of difference in how to tackle shooting conditions. Subtle light falling on the bed in a dark room was no problem: f/2.8 and ISO 250 meant a clean image because the camera hadn't been forced to boost the sensitivity to make an exposure. A competitor model might have to shoot at f/5.6 which would bump the same shot to ISO 1250 and, we're sure, make a stark difference in the results. Everything we threw at the Stylus 1 resulted in rarely needing to use above the ISO 800 mark, which is testament to having a fast lens. And when you have fast autofocus and a wide aperture the camera becomes an enabling tool; one that can shoot where other models would otherwise fail. It's here that we doff our hats to the Stylus 1 for making shooting easy. Even when we did need to use ISO 800, such as shooting neon signs in a bar, the resulting shots are largely devoid of excess image noise. Add in that f/2.8 aperture setting when shooting at the long-end of the zoom and the resulting blurred background effect looks great too. Overall we're pleased with the Stylus 1's images. But some processing excess and optical limitations cost it from achieving full marks in this department. There's no getting around it: the Olympus Stylus 1 is a pricey bit of kit. But is it worth it? Absolutely. Because it's an camera that enables. There's that significant zoom lens with a constant f/2.8 maximum aperture and fast autofocus which saw us snapping some lovely shots. What lacks is the sort of image processing finesse that such a high price tag might suggest. Yes it's a compact camera - well, a bulky one by that definition - but one that isn't going to compete with the larger sensor models in terms of finer detail results. But what it does offer is features by the boat load. It's rare a compact comes loaded with such a quality electronic viewfinder which is further justification for the price tag and there's nothing else out there with a 28-300mm f/2.8 equivalent lens at this sort of scale. If you can get over the price and don't mind the chunky size then there's a whole lot of goodness on offer. The Stylus 1 is that little bit different; it's Olympus doing high-end compact in its own way. Although not quite perfect, it's a distinctive proposition that has plenty of merit.